What's important is that the geometry is almost identical. I think it looks ok, I'm sure it looks much better once you're playing. Edited by Syracuse022, 28 August 2014 - 01:47 PM. But how will we know a battle is going on unless everything's brown and red? Didn't you know that there are no sunny skies on battlefields? No wars are fought on grass? Only rain, harsh fog, and brown. Edited by Nightshade, 28 August 2014 - 02:04 PM. I just hope they don't try to "fix it" like they attempted to with Halo 3. Reminded me of the dlc trailer they put out awhile back. Still good. Edited by DualX, 28 August 2014 - 02:38 PM. Look closely at elbow on the new version (or, you know, the huge bubble shield on Ascension) and abandon all hope. I don't think that really destroys it. This version seems to have all of the lines of sight so far. "Most prominent among these are a bit of cover added to the 'Elbow,' the long walkway connecting the grav lift to the sniper tower, and a dynamic element that should help counter an entrenched group of enemies. Of course this can be disabled in Forge for players who want a near-match of the original experience." Edited by DualX, 28 August 2014 - 09:16 PM. 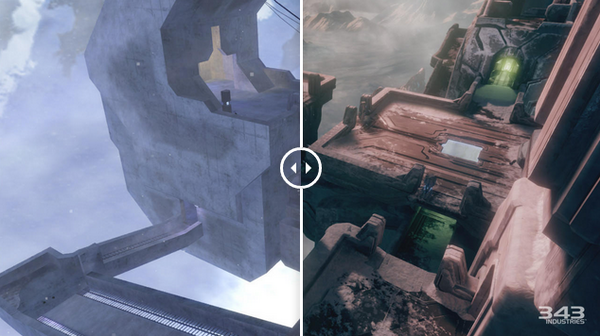 I still like the colors of the original a lot more, but damn that gamplay looks a *lot* like Halo 2. Also, there's a part where he shoots part of the ceiling and it falls down and kills someone? I didn't know there's was that kind of destruction. Definitely. That actually reminds me of those same things you could shoot down in Waterworks. So, I played the remake multiplayer at PAX on Lockout. Pretty much identical to Halo 2. I actually had a lot of fun (too bad about me getting 22 kills and nobody on the rest of my team getting more than 5). That's cool that you got to play. What did you think of how the map looked? Here's the direct download link for the 1080p/60fps video. Here is the youtube non-60fps version of the same video. It looked fine, honestly. Image quality is pretty much perfect, and the framerate was rock solid. Nothing obnoxious hindering visibility, so I can't really complain. I would prefer it to be a bit less washed out, but at this point, I've just come to accept the fact that Microsoft is enamored with BROWN and BLOOM, so I won't even try to fight it anymore. This batch of footage has gotten me excited about the new mp. I wasn't interested at all but seeing how close it looks to H2 makes me realize that H2 with updated graphics would be pretty awesome. That is, assuming they keep putting out new maps for it. Quick pro gameplay gif from the H2A tourney this weekend. My body is ready. Halo 2 is back and I'm loving every bit of it. Have we heard anything about reworked net code? Obviously a given for H1, but what about 2 and 3? Played 3 again the other night and hoooo boy it wasn't exactly the most pleasant experience in the world. We're working with faster hardware so I would think those load times would diminish as the majority of the wait time was for the maps. In theory. Plus, we're working with dedicated servers now so I would imagine the games should be smoother too. Some new Zanzibar screens. The Spartan models are looking a bit better, and the map itself looks great.